I have this mobo from mid 2014. It's been sitting in a case until now. I have an odd issue with mobo not powering on, an odd mobo/psu issue. The PSU is a new Corsair AX860i. The main power cord is one plug on mobo side that splits out to two smaller plugs on PSU side. The PSU has a relay inside that will click on (or off) if the PSU senses an issue. What the issue is exactly I don't know but when I insert either of the two plugs into PSU side the PSU relay clicks, thus it will not provide power to mobo. This Z87 mobo has two 8 pin power plugs on the side that I am not using. Are these power plugs required to be used? The system is rather basic, GeForce GTX760 video, intel zeon, 128GB ram, Corsair cpu water cooler, three solid state sata drives, one DVD drive, and 3 fans (push-pull on cooler, and one in case up front). Warranty is a no-go, too old. I did inspect the mobo out of the box, did not see anything obvious, it looks good. I do not have another PSU to test with. Any tips or suggestions or things to test? I have Oscope and meters, so I can troubleshoot, just not really sure what to test, etc. You need to connect at least 1 8 pin (CPU) power cable to the board or it will not power up. 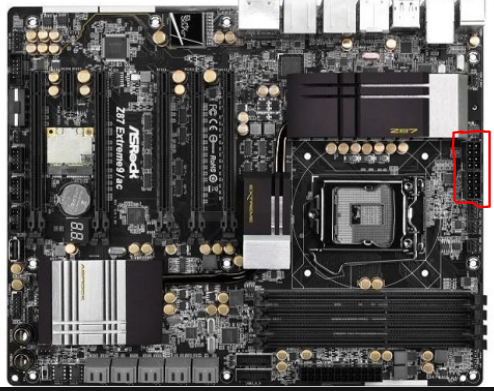 Are you talking about 1 of the 2 8pins on the side of the mobo, AND the 24pin mobo connector to the PSU? See the pic I attached. I thought the mobo manual says the 8pins provide power (optional) to a 12phase regulator? Should I connect both of the 8pin power sockets to PSU? The PSU has the room for it. Yes, those 2 8pin connectors. The top one (as per the pic) is 100% required, the one below is optional (not needed unless you are using multiple GPUs or other high power PCIe add in cards). This apparently has solved the issue. Now onto BIOS settings and OS install. Hopefully this PSU will stay stable.